Trace the outline of your hand onto a piece of paper. Cut out the handprint. Use an eraser to carefully erase any pencil marks that are on the paper hand shape after you cut it. Curl the bottom of the hand shape into a cone, leaving a very small hole at the tip of the cone, just large enough to fit a pipe cleaner through. The pipe cleaner needs to be snug, so make sure the hole is small. Use a small piece of tape to hold it together. Use a round pencil, pencil crayon, or marker to curl each one of the fingers of the handprint outwards. Bend the yellow pipe cleaner in half. Make a small "J" shaped hook on the end of the green pipe cleaner and loop it over the bend in the yellow pipe cleaner. Pinch the "J" shape in the green pipe cleaner so it tightly holds the yellow pipe cleaner. Bend one side of the yellow pipe cleaner in half again, leaving the other side straight. Then take the longer end of the yellow pipe cleaner and wrap it tightly around the shorter bent sides of the yellow pipe cleaner. Keep wrapping tightly until you reach the end of the yellow pipe cleaner. Take the pipe cleaner stem and poke it through the middle of the hand print flower, pulling it all the way through so the green stem is below the flower and the yellow part is in the middle of the flower. 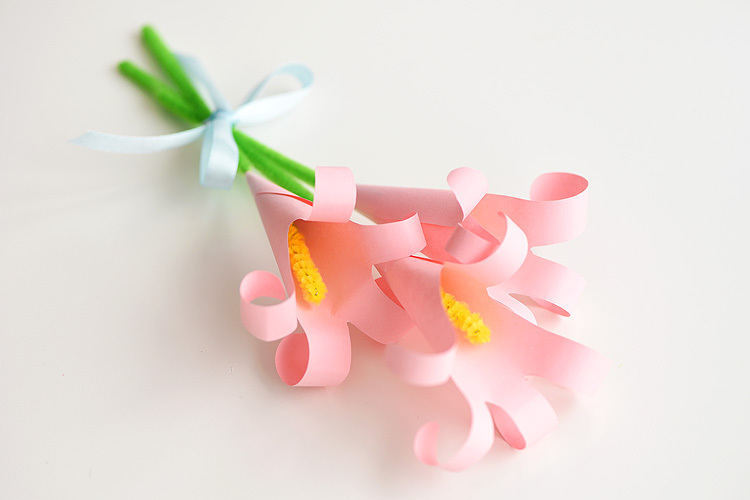 Repeat all of these steps to make a small bouquet, then tie it together with a ribbon.